It seems that I’ve been immersing myself in stories about toxic Christianity lately. 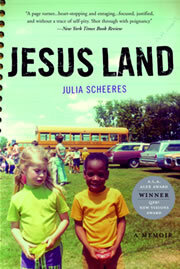 Julia Scheeres’ memoir of growing up with her adopted black brother David in a hellish “Christian” home hasn’t made me feel any better about the evangelical subculture. In fact, I am beginning to wonder if Christianity itself might be broken beyond repair. Though a harrowing read, the book is a beautiful testament to the power of hope and love (and the corrosive power of twisted faith). Scheeres and I are around the same age (and even attended the same college), and I found myself nodding in recognition of some of the trappings of Christian life in the 1980s: Keith Green, Sandi Patti, Petra, the mistrust of anything “secular”, the obsession of our youth leaders with sexual immorality and especially abortion. The difference is that I spent my teens in a safe, happy place, and Julia spent hers in a tyrannical Christian reform school in the Dominican Republic. Julia and David cling to each other during this time and her descriptions of both the horrors of the school’s “Program” and her rare moments of freedom with her beloved brother are written in the immediacy of the present-tense, like a teenager’s diary. This is powerful stuff, and by the end, I was amazed at her and her brother’s resilience. With the traditional safe places of family and church twisted into abusive prisons, her relationship with David is a lifeline for both of them. At times I was shaking my head in disbelief, but on her website, she includes supporting documents from Escuela Caribe, the reform school she was sent to by her parents after a little too much teenaged rebellion. And she links to a site for “survivors” of the school’s regime, which may bring some much-needed catharis and hopefully shut Escuela Caribe down and other places like it. Yes, incredibly, the school is still operating. I’m happy and amazed that Julia has been able to make a life for herself as a writer, and a good one. She is happily married and has just had a baby girl, and though her faith has been completely shattered, I know that her daughter will receive a far more “Christian” upbringing than she ever did. In these days when the rise of the Christian Right seems to have caught us all by surprise, it’s good to see that these dark undercurrents have been there all along. In more happy fun religion news, next month’s Doc Soup screening will be Jonestown: The Life and Death of Peoples Temple. Another story of religious madness in the Caribbean jungle. Can’t wait. Could it be that, somewhere along the line, a lie was perpetuated and readily accepted by the simple that faith was somehow a substitute for a functioning intellect? Or are people just stupid and irresponsible from the outset? I have developed two observations of human nature. One is that people are only themselves when they believe they will escape responsibility for the repercussions of their actions (for example, when they are not observed by anyone in power). The second is that people seem to think that God, whatever God might be, is mostly on their side, and sees the world as they doâ€”regardless whether they judge themselves good or bad. It makes it hard to imagine that people believe in God at all, at least, as anything other than an extension of themselves, but just say that they do. I hope this comment isn’t totally out of line. broken beyond repair? I should be the first person to say, “Yeah it is and we should move on…” But as someone disillusioned by the whole religion thing, I look at you with a positive aspect of faith and just hope you and people of your ilk can fix what the majority has broken. I feel like I am raising my self intellectually above so much of the world when I think that while I don’t need religion, so many people do. But if my arrogant behaviour carries any weight and the people who would rather not think for themselves need a religion, I would hope the thinkers could help them see one that is not hateful or harmful. Have you seen the movie Jesus Camp? I have it in my Netflix queue…but haven’t seen it yet. I hear that it’s pretty damning for a certain subset of Christians. Lenn, I have seen the film but haven’t been able to formulate my thoughts in a coherent way. I have the DVD and am planning to watch it again and hopefully make a proper post about it. It was remarkably even-handed, though. Previous Previous post: Consolation Champ!